4 5/8" deep, 8 5/8" diameter"
Designed by the makers of the All American Pressure Canner, this Chef's Design 4.8-Quart Pressure Cooker is made of 18/10 stainless steel with a mirror-like finish. 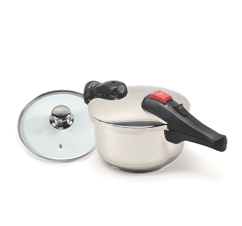 Key features include heat-resistant handles, two pressure regulating weights (7.5 and 11.6 psi) for standard and high-pressure cooking. Finally, an aluminum/steel bottom that prevents hot spots. It can even be used as a standard saucepan with the include tempered glass cover.